Shower Anywhere with the RinseKit! If you’re going on a casual camping trip with your family, or if you just aren’t the biggest fan of completely roughin’ it when you’re in the backcountry, then odds are you would ideally like to maintain some level of hygiene on your adventures. Of course, when you’re in some of the world’s more unforgiving regions, however, the availability of urban luxuries is limited to say the least. I’m sure we’ve all had days where we’ve slogged through muddy, long hikes, and really, really wish we could shower at the end of the day, but there are no showers for miles, and that algae-covered pond by the campsite looks like it might be more dirtying than cleansing. 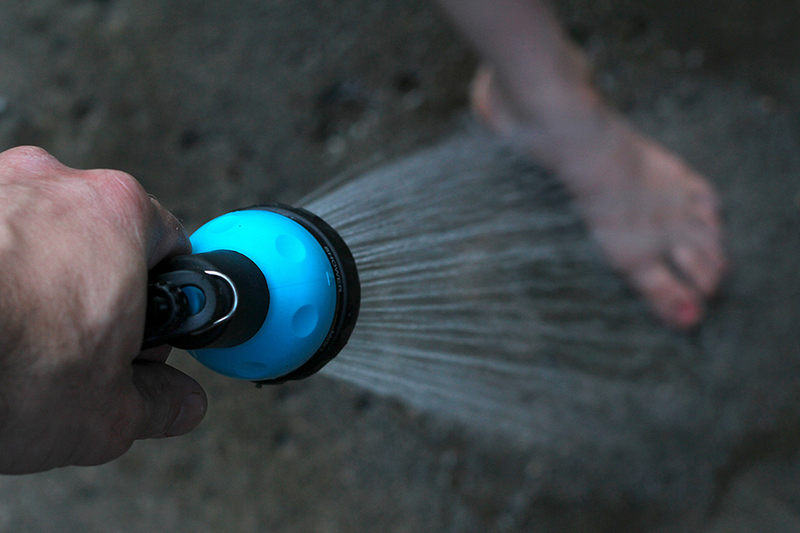 Well, thanks to the innovative new RinseKit Portable Shower, outdoor cleanliness is now possible – and incredibly easy. The RinseKit is a portable, pressurized water tank that can hold up to two gallons of water. By the weight of this water alone, this item probably isn’t something you want to schlep around when backpacking, but if you’re car camping or have an easily-accessible base camp, then this portable shower will make your life a whole lot cleaner. The RinseKit’s chamber maintains about 65 PSI of water pressure, and an internal reservoir expands to keep the pressure intact even as you move around. This allows you to simulate the water pressure of a shower just about anywhere, making it a much more effective way to blast away grit and dirt than simply taking a dip or using a water bottle. 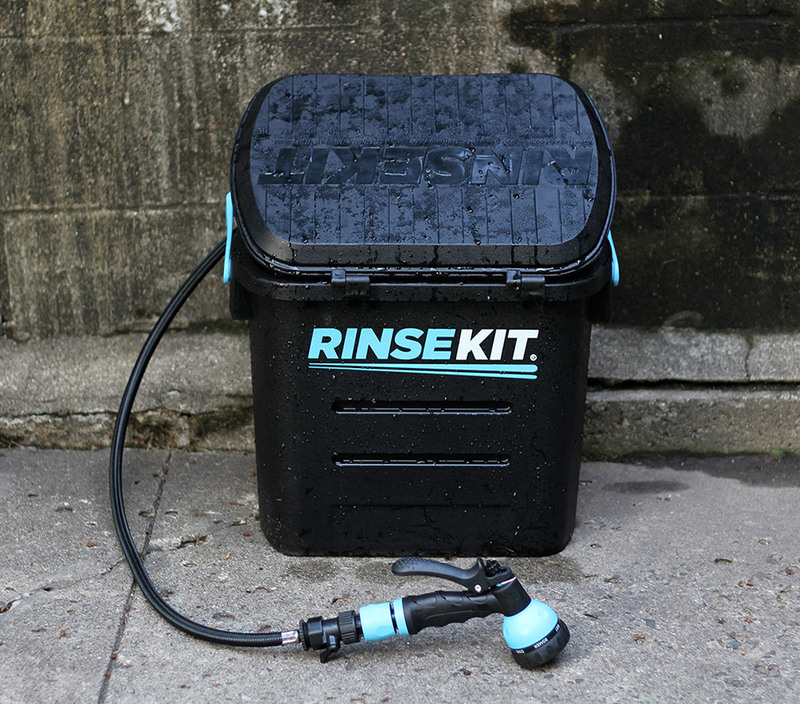 Since it does not need batteries nor any pumping to work, the RinseKit is perfect for a low maintenance option in the outdoors, and its potential uses are many. Aside from showering, you can use the RinseKit to effectively clean dishes, wash off gear, and even clean fish to prepare for dinner (it also comes with a built-in ruler to measure any aquatic specimens you may catch). Without a doubt, having pressurized water can make life around camp much easier and more convenient. Of course, two gallons of water is not that much, so if you plan on using the RinseKit heavily, you’d be wise to bring some fresh water refills – which should not be a problem if you’re car camping. The RinseKit has seven different spraying modes, from a light mist to a jet blast, and the water is drained at different speeds accordingly. If you use the device on the preset shower mode, RinseKit claims that you will get four minutes of continuous water in which to wash yourself. That may not seem like that long, but when compared to sleeping the night covered in grime, four minutes can make a huge difference. If you want a warm shower from the RinseKit, it is not a problem. Simply leave the black, heat-absorbing box sitting in the sun while you hike all day, and you’ll come back to a nice, warm shower after your day on the trail. Sometimes the easiest solution is also the best solution. The RinseKit weighs about 24 pounds when it is full, so you’ll definitely want to leave in behind during long hikes or multi-day camping trips. However, if you have a more casual camping trip planned, it may be worth bringing the RinseKit along to stay clean, fresh, and reinvigorated. This product can be used for much more than camping, though. The RinseKit was designed by a surfer, and will suit you well after a day in the ocean, at the beach, on the trail, or anywhere else you might get dirty far from civilization. At $90, the RinseKit is a worthwhile purchase for avid car campers and outdoorsmen and women who want a little extra comfort and don’t mind the weight. This product is one of a kind right now, and it may just change your camping experience in general. You can buy the RinseKit here! 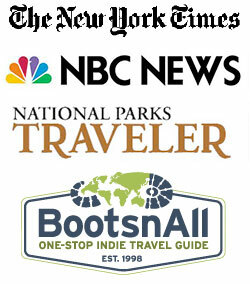 Perry Rosenbloom is the founder of Glacier National Park Travel Guide. He started the site in 2008 after spending 2 summers working in Glacier. Outside of visitor contributions, he writes every single article based off of his unique experiences and knowledge of Glacier. Learn more about me here. How can I improve GNPTG? Got some feedback? Then let me know!